Following completion of this article, the Indiana Senate amended Senate Bill 12, removing all of the protected classes, such as race and sexual orientation, from the bill. The amendment, authored by Sen. Aaron Freeman, passed 33-16. Gov. Holcomb said Tuesday night that, “The version of the bill approved today by the Senate does not get Indiana off the list of states without a bias crime law.” He said he will continue to fight for an alternate outcome. The bill will have a third reading later this week. It is unclear whether it will pass. 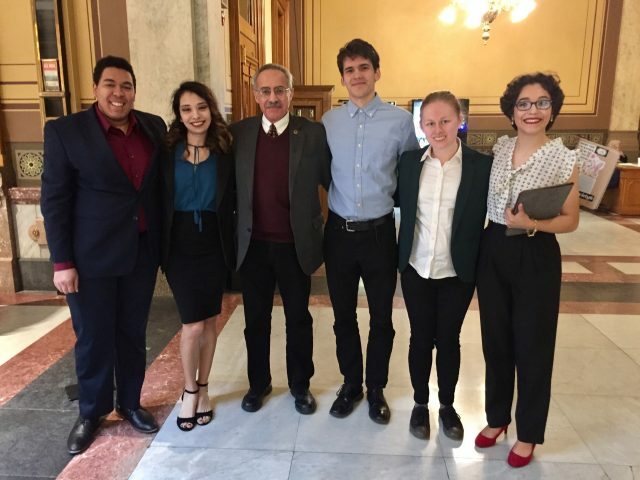 Six Goshen College students testified in favor of Senate Bill 12 at the Indiana Capitol in Indianapolis on Monday. This bill calls for the need of a hate crimes protection legislation — Indiana is one of only five states with no such laws. GC students Zachariah Begly, Emily Bennett, Sandra Cortez, Gabe Miller, Lizeth Ochoa and Christi Sessa all testified. Richard Aguirre, community impact coordinator, also testified. The group traveled to Indianapolis on Sunday afternoon and stayed overnight in order to arrive at the Senate Chamber for the 8 a.m. hearing. A second group of GC students made the drive at 6 a.m. on Monday to witness their peers testify as part of Kendra Yoder’s social policy class. President Rebecca Stoltzfus has previously shown support for this legislation. She was one of 24 higher education leaders who signed a letter of encouragement for hate crime legislation. This marks the sixth consecutive year of trying to get a hate crimes law passed. In the past, calls for hate crime laws were championed by Democratic senators. However, this most recent bill was authored by Republican Sens. Ron Alting and Mike Bohacek. It was first read on Jan. 3. It was referred to the Committee on Rules and Legislative Procedure before being reassigned to the Committee on Public Policy on Feb. 14.. Gov. Eric Holcomb is also in support of the bill, which he considers a top legislative priority this year. When the GC students were called to give their testimonies they each had two minutes to give their perspectives on the issue. If they went over the allocated time they would be cut off. “You could really tell they’d worked on them to really pack a punch into that two minute time that they had,” said Madeline Kauffman, a sophomore social work major, who was in attendance with her social policy class. Miller followed by telling a story from middle school of students who had been throwing loose change at Jewish students in the hallways and the need to name specific categories for which people are targeted. Bennett, who is bisexual, then spoke of her experience of the hate her LGBTQ+ friends have faced. Kauffman said that Bennett’s testimony stood out to her. Ochoa also spoke as a DACA recipient and Begly spoke of his first encounter of racism. Sessa concluded the testimonies from GC students by giving their experience as a bisexual and transgender Indiana resident. They spoke of their gratitude towards the two Republican co-sponsors and the fact that sexual orientation and gender identity were both covered in the bill. “This is what makes me feel welcomed and loved in this state,” Sessa said. They went on to explain how they are afraid to disclose their transgender status at work as the anti-discrimination policies do not include gender identity. After nearly three hours of testimonies were heard, the senators approved the bill with a 9-1 vote and added Sen. Greg Taylor as a third author and Sen. Lonnie Randolph as co-author. The bill will now go to the full Senate for consideration. Following the hearing, the students were encouraged by Taylor to remain engaged in advocating for a hate crimes bill. “Seeing my colleagues give these statements with so much meaning and passion behind it, doing what we’re called to do as citizens was really powerful and exciting,” Kauffman said.